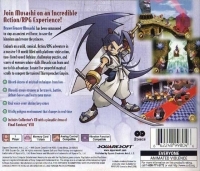 Box Text: Brave Fencer Musashi has been summoned to stop an ancient evil force, to save the kingdom and rescue the princess. 08-21-2014 mark1982 Box Text Brave Fencer Musashi has been summoned to stop an ancient evil force, to save the kingdom and rescue the princess. Embark on a wild, comical, Action/RPG adventure in a massive 3-D world filled with platform-style action, two-fisted sword fighting, challenging puzzles, and scores of enemies whose skills Musashi can learn and use to his advantage. Locate five powerful magical scrolls to conquer the twisted Thirstquencher Empire. 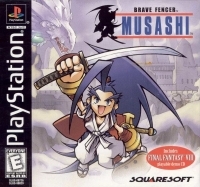 08-21-2014 nunocaires Box Text Brave Fencer Musashi has been summoned to stop an ancient evil force, to save the kingdom and rescue the princess. Embark on a wild, comical, Action/RPG adventure in a massive 3-D world filled with platform-style action, two-fisted sword fighting, challenging puzzles, and scores of enemies whose skills Musashi can learn and use to his advantage. Locate five powerful magical scrolls to conquer the twisted Thirstquencher Empire. This is a list of VGCollect users who have Brave Fencer Musashi in their Collection. This is a list of VGCollect users who have Brave Fencer Musashi in their Sell List. This is a list of VGCollect users who have Brave Fencer Musashi in their Wish List.